Bullous disease of dialysis, or bullous dermatosis of dialysis, is a syndrome of cutaneous fragility and blistering. [1, 2] The skin lesions clinically and histologically resemble those of porphyria cutanea tarda. Lesions occur predominantly in sun-exposed skin—most often on the dorsal hands—of individuals treated for chronic renal failure with maintenance dialysis regimens. (See Presentation.) See the image below. Because plasma porphyrin levels in individuals with chronic renal failure may be mildly elevated,  or occasionally high enough to overlap levels seen in porphyria patients with normal renal function,  porphyrin photosensitization may play a contributory role in some cases. It is not likely to be the primary cause, however, because many dialysis patients with similarly mild elevations of plasma porphyrin levels do not develop photocutaneous lesions. Speculation that photosensitizers encountered during dialysis (eg, compounds emanating from plastic tubing) are responsible for the disorder remains unproven. The concomitant use of therapeutic agents with phototoxic potential (eg, furosemide) cannot be identified in most cases. A possible, but unproven, cause of bullous disease of dialysis may be overproduction of porphyrins resulting from effects of high aluminum concentrations (from therapeutic or environmental sources) on enzymes of heme biosynthesis. In 6 dialyzed patients with bullous dermatoses and high serum aluminum levels, Gafter et al found elevated plasma porphyrins approaching or surpassing those seen in true porphyria cutanea tarda. Potential benefit from aluminum chelation with desferrioxamine in such cases was considered. The frequency of bullous disease of dialysis among dialysis populations in the United States has not been accurately determined but may be similar to that reported from several European surveys. Although no race predilections have been reported for bullous disease of dialysis, individuals with less melanin pigmentation of the skin have less natural photoprotection and may be more likely to develop dialysis-related cutaneous fragility and blistering. Although some surveys have reported a male predominance for the disease, a higher female-to-male ratio has also been noted. In none of these surveys, however, was the male/female composition of the underlying population stated. Thus, the male-to-female data reported may reflect differences in the frequency with which men and women occurred in the source populations. Most reported cases of bullous disease of dialysis have involved adults. However, this may reflect the predominance of older individuals with end-stage renal failure among populations treated with chronic dialysis regimens. Gilchrest B, Rowe JW, Mihm MC Jr. Bullous dermatosis of hemodialysis. Ann Intern Med. 1975 Oct. 83(4):480-3. [Medline]. Keczkes K, Farr M. Bullous dermatosis of chronic renal failure. Br J Dermatol. 1976 Nov. 95(5):541-6. [Medline]. Poh-Fitzpatrick MB, Sosin AE, Bemis J. Porphyrin levels in plasma and erythrocytes of chronic hemodialysis patients. J Am Acad Dermatol. 1982 Jul. 7(1):100-4. [Medline]. Gafter U, Mamet R, Korzets A, Malachi T, Schoenfeld N. Bullous dermatosis of end-stage renal disease: a possible association between abnormal porphyrin metabolism and aluminium. Nephrol Dial Transplant. 1996 Sep. 11(9):1787-91. [Medline]. Brivet F, Drüeke T, Guillemette J, Zingraff J, Crosnier J. Porphyria cutanea tarda-like syndrome in hemodialyzed patients. Nephron. 1978. 20(5):258-66. [Medline]. Chazot C, Chazot I, Charra B, et al. Functional study of hands among patients dialysed for more than 10 years. Nephrol Dial Transplant. 1993. 8(4):347-51. [Medline]. Griffon-Euvrard S, Thivolet J, Laurent G, et al. [Detection of pseudo-porphyria cutanea tarda in 100 hemodialyzed patients (author's transl)]. Dermatologica. 1977. 155(4):193-9. [Medline]. Amblard P, Cordonnier D, Reymond JL, Beani JC, Elsener M, Guffon MP. [Pseudo-pseudo-porphyria tarda in hemodialyzed patients]. Ann Dermatol Venereol. 1981. 108(12):1019-20. [Medline]. Gibson GE, McGinnity E, McGrath P, et al. Cutaneous abnormalities and metabolic disturbance of porphyrins in patients on maintenance haemodialysis. Clin Exp Dermatol. 1997 May. 22(3):124-7. [Medline]. Shelley WB, Shelley ED. 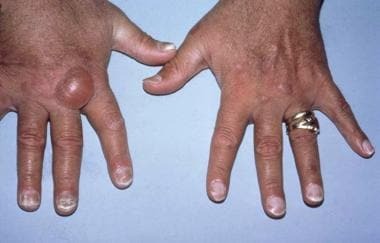 Blisters of the fingertips: a variant of bullous dermatosis of hemodialysis. J Am Acad Dermatol. 1989 Nov. 21(5 Pt 2):1049-51. [Medline]. Perrot H, Germain D, Euvrard S, Thivolet J. Porphyria cutanea tarda-like dermatosis by hemodialysis. Ultrastructural study of exposed skin. Arch Dermatol Res. 1977 Aug 22. 259(2):177-85. [Medline]. Thivolet J, Euvrard S, Perrot H, Moskovtchenko JF, Claudy A, Ortonne JP. [Pseudo-late onset cutaneous parphyria in haemodialysis patients. Clinical and histological features. 9 cases (author's transl)]. Ann Dermatol Venereol. 1977 Jan. 104(1):12-7. [Medline]. Puchades MJ, Saez G, Muñoz MC, Gonzalez M, Torregrosa I, Juan I, et al. Study of oxidative stress in patients with advanced renal disease and undergoing either hemodialysis or peritoneal dialysis. Clin Nephrol. 2013 Sep. 80 (3):177-86. [Medline]. Vadoud-Seyedi J, de Dobbeleer G, Simonart T. Treatment of haemodialysis-associated pseudoporphyria with N-acetylcysteine: report of two cases. Br J Dermatol. 2000 Mar. 142(3):580-1. [Medline]. Tremblay JF, Veilleux B. Pseudoporphyria associated with hemodialysis treated with N-acetylcysteine. J Am Acad Dermatol. 2003 Dec. 49 (6):1189-90. [Medline]. Massone C, Ambros-Rudolph CM, Di Stefani A, Müllegger RR. Successful outcome of haemodialysis-induced pseudoporphyria after short-term oral N-acetylcysteine and switch to high-flux technique dialysis. Acta Derm Venereol. 2006. 86 (6):538-40. [Medline]. Cooke NS, McKenna K. A case of haemodialysis-associated pseudoporphyria successfully treated with oral N-acetylcysteine. Clin Exp Dermatol. 2007 Jan. 32(1):64-6. [Medline]. Felix RH, Silva MF Jr, Almeida JB, Neto PB. Pseudoporphyria associated with hemodialysis. Kidney Int. 2011 Jan. 79 (1):140. [Medline]. Guiotoku MM, Pereira Fde P, Miot HA, Marques ME. Pseudoporphyria induced by dialysis treated with oral N-acetylcysteine. An Bras Dermatol. 2011 Mar-Apr. 86 (2):383-5. [Medline]. Azak A, Yenigün E, Koçak G, Huddam B, Kahve B. Pseudoporphyria in a hemodialysis patient successfully treated with oral glutamine. Hemodial Int. 2013 Jul. 17 (3):466-7. [Medline]. Pranteda G, Bottoni U, Tayefeh Jafari M, Pranteda G, De Micco S, Muscianese M, et al. Dialysis-associated pseudoporphyria successfully treated with vitamin D. Report of two cases. G Ital Dermatol Venereol. 2015 Jun. 150 (3):327-9. [Medline]. El Kabbaj D, Laalou A, Alouane Z, Bahadi A, Oualim Z. Hemodialysis-associated pseudoporphyria resistant to N-acetylcysteine. Saudi J Kidney Dis Transpl. 2011 Mar. 22 (2):311-4. [Medline].